Town home, 2 Bedrooms + Loft, 2.5 Baths, (sleeps two to eight). 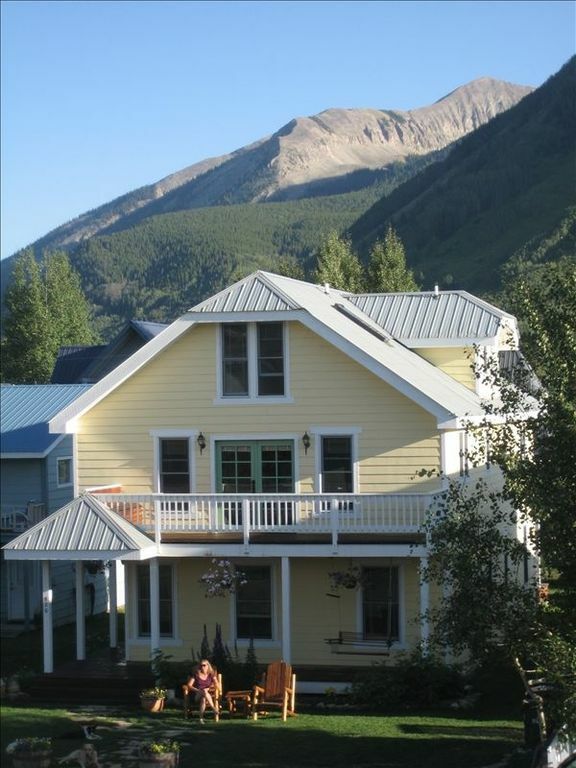 Town home located in the quaint village of Crested Butte. Construction completed in 1998 with incredible views of the surrounding mountains. Open, sunny living space. Three levels including a heated mudroom entryway, two bedrooms, each with its own TV and queen bed, a sleeping loft with two queen beds and half bath, two additional full baths, complete laundry and kitchen with everything you'll need. Main level has vaulted ceiling, gas fireplace, walk-out deck with gas barbecue, adjoining kitchen. Designer decorated throughout. Sleeps up to eight people in four queen beds. Radiant heat to warm your toes! Conveniently located two blocks from the free shuttle that takes you on the seven minute, three mile ride up to Crested Butte Mountain Ski Resort. Quiet, in town location is where you want to be. Park your car and walk to nearby restaurants, night spots, theaters, and shopping. Walk out the front door to Nordic ski trails in the winter and mountain bike and hiking trails summer and fall. Beautiful, comfortable, and convenient! In town, cozy and convenient, beautifully furnished and maintained, SPECTACULAR VIEWS! Overall, the property is nice and in good shape. Happy that you enjoyed your stay. Hope you come visit again and have quieter neighbors! Very comfortable home and close to two shuttle pick ups that take you up to Mt. Crested Butte and the ski area. The duplex is also a comfortable walking distance to town and the market. It was an extra plus that we were able to bring our dogs with us. We'd go back. Happy that you enjoyed your stay! Excellent location! Short walk to main drag. Beautiful property and location. Exactly what we were wanted for our weekend vacation!! Thanks Jill for the kind words! The house exceeded our expectations! Loved it! Wish we could have stayed longer but will definitely stay here on our next trip to Crested Butte. Thanks for everything! Looking forward to ypour next visit. Great location, great house, and everything we needed. This is a very nice duplex in a great location with a short walk to downtown. Plenty of room for 4 adults and a dog. Really enjoyed sitting on the deck enjoying the scenery. We cooked most of our meals at the house, and the kitchen is stocked with everything we needed. Grill on the deck was nice to have, and we used the cruiser bikes everyday as well. Happy you enjoyed your stay! One of our favorite things to do as well is sitting on the deck soaking in the views. Hope that you’re able to return. Lovely home with lots of charm and a great location! Home is very comfortable and clean, located in a quiet, picturesque part of town. Walk to restaurants and shops downtown. Highly recommend staying here! Thanks for the kind words. We’re happy that you enjoyed your stay in magical Crested Butte. Rates are subject to change until reservation is confirmed with a deposit. Stays of 4 nights or less require payment in full to hold the reservation. Stays of 5 nights or more can be guaranteed with a 50% deposit when making the reservation (if more than 90 days prior to the rental date). The balance of payment is due 90 days before the rental date. Reservations are not booked until the deposit has been received. When payment is received I will email confirmation, along with instructions on how to gain access to the property. PLEASE EMAIL ME AFTER YOU'VE MAILED THE CHECK. Cancellation Policy: Cancellations more than 90 days prior to check-in will be fully refunded less a $100 cancellation fee. Cancellations less than 90 days prior to check-in are NON-REFUNDABLE , unless I am able to book the property for the dates you had reserved. Or the deposit can be credited to a future, mutually agreeable date. If we re-book the property we will refund a prorated share of the rental fee for each day that we are able to fill, less the $100 cancellation fee. Thanks for choosing our property. Paul Caldwell These Terms are somewhat flexible.